The Vascular Biomechanics Group in the Department of Biomedical Engineering at Texas A&M University investigates the role of biomechanics in the treatment of vascular disease. In particular, we use MSC Software to investigate the solid mechanical implications of implanting vascular stents and aortic stent grafts (Figure 1). Cardiovascular diseases are the principal cause of death in the United States, with total cost associated with the disease in upwards of $450 billion USD. As a result, an extensive effort has gone into developing biomedical devices to treat these diseases. As the placement of these devices alters the biomechanical environment inside an artery, proper computational mechanical analysis must be carried out to ensure their treatment efficacy, but also to examine the mechanical loads that they place on the arterial wall. MSC Software allows for proper analysis of these inherently difficult (e.g. non-homogeneous, non-linear) contact mechanics problem. MSC Software allows for construction and simulation of vascular stent implantation to examine the mechanical implications of varying specific design parameters on the arterial wall mechanics (Figure 2). Through the modeling of biological tissues and the application of physiologic boundary conditions, appropriate finite element models can be developed in Patran and solved with Marc. Figure 2: Stent Geometry: Patran models of vascular stent designs created by varying specific design parameters (f,&##961;,h). The designs on the right are approximately 5 and 20 mm in outer diameter and length, respectively. Computational analyses of these models were then carried out to assess their biomechanical impact on the arterial wall. Figure 3: Stented Artery Model: An MSC Software simulation illustrating the circumferential stress distribution on the arterial wall after modeling stent implantation. 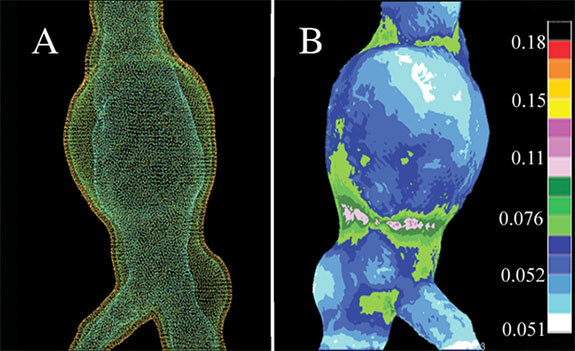 Patient specific computational models of abdominal aortic aneurysms (AAA) are also investigated in our laboratory to assess treatment methods and/or device design. Patran provides an excellent means of constructing finite element models from various medical imaging techniques to examine the biomechanical environment after aortic stent graft implantation. Figure 4: Aortic Stent Graft Model: A. Computational mesh of an AAA with different biological tissue components B. Max principal strain field on outer vessel wall. Through proper computational analysis, which MSC Software provides, our laboratory is able to examine the mechanical impact of implanted vascular medical devices. Such analysis, along with clinical evidence of device success/failure, can provide information in optimizing biomedical device designs and treatments. Bedoya, J., Meyer, C.A., Timmins, L.H., Moreno, M.R., Moore, J.E. Effects of Stent Design Parameters on Normal Artery Wall Mechanics. J Biomech Eng. 2006; 128:757-675. Timmins, L.H., Moreno, M.R., Meyer, C.A., Criscione, J.C., Rachev, A., Moore, J.E. Stented Artery Biomechanics and Device Design Optimization. Med Biol Eng Comput. 2007; 45:505-513.